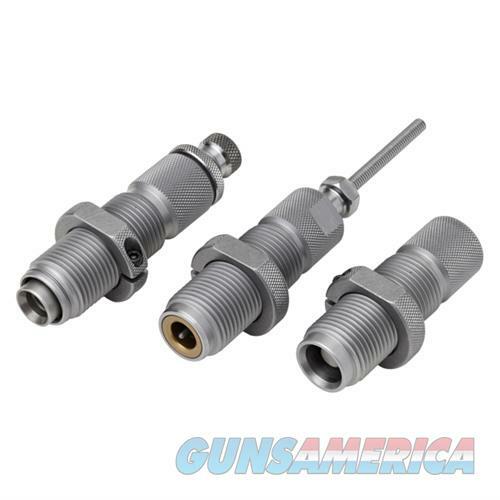 Description: Hornady 546503 30 M1 Carbine Full Length 3-Die Set Hornady's Custom Grad Dimension dies are created from select steel that's heat-treated to ensure the durability needed for a lifetime of reloading. Hornady guarantees they'll never wear out or break under normal use. All dies include the popular double-flat Hornady die lock rings installed and a custom plastic box. Hornady dies are grouped in three series for pricing - die construction and quality is equal in each series. The Custom Grade Full Length 3-Die Set includes a Custom Grade Full Length Die, Seater Die, and Expander Assembly. Dies are complete with Zip Spindle decap assembly and double-flat lock rings, packaged in a custom plastic die box.